Keith John Baalham was born on 11 November 1946 and began his rugby career at Cirencester Grammar School, a few years ahead of Steve Mills. He benefited from the presence of sports master Derek W. Quant who played in the centre for Cheltenham. There was a natural association with Cirencester RFC, but Derek directed Keith towards Gloucester because they had the beginnings of a development system in that the County U15 Schools team was based there. In 1961/62 he progressed through the selection process to be England vice-captain in the two internationals that season. J.B.G.Thomas, one of the newspaper reporters at the Arms Park game, chose to include the above picture of Keith (in white and not immediately recognisable) in the rugby annual he edited for that season. Having been associated with Gloucester, the next natural step was for Keith to progress within the Club and he played in the back row for United on 27 Oct 1962 against Pontypool United, where he scored a try – playing on what he recalls as seeming like the remains of a slag heap. Unfortunately, after this appearance a motorbike accident accounted for his failure to reappear in any matches for the rest of the season. At the end of the 1963 academic year he decided on a nautical career, moving to Plymouth’s School of Navigation and playing some rugby for the club there. On completion of the course in 1964 family problems resulted in his moving back to Cheltenham. 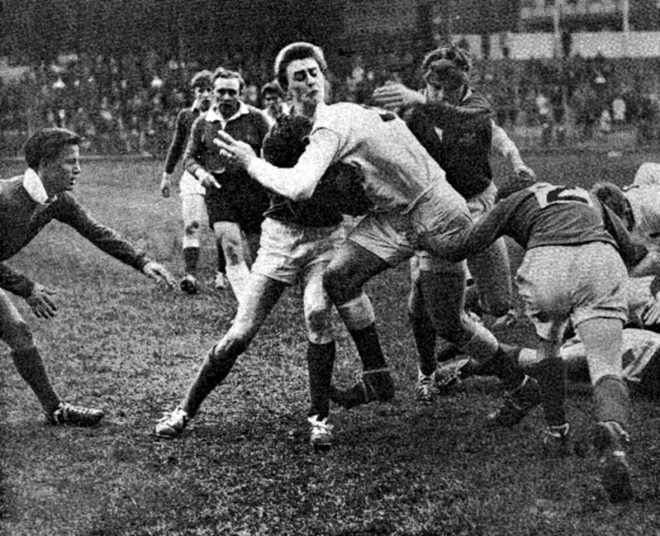 He played alongside Mike Burton in the England National Association of Boys’ Clubs team, against the Welsh equivalent at Neath and Bridgewater in the 1963/64 season. Now at North Gloucester Tech at the start of the 1964/65 season, he re-joined Gloucester, to play twice in the 1st Team, initially against Coventry on 24 October 1964 (aged 17) and subsequently against Moseley on 14 November, which was Mike Burton’s debut game. Shortly after this another motorcycle accident ended that season’s appearances. After Manchester Uni he took up a different sort of navigation (wisely giving up his motorbike) and joined the RAF in 1969. This allowed him to start his career in aviation and resume the one in rugby. Various postings gave him the chance to play outside (for Wakefield in 1973) as well as inside the service and in 1975 for the service. Notably against Bath at the Rec: a try against London Welsh at Deer Park (John Taylor in their back row) in the company of full internationals such as Peter Larter (England) and Billy Steele (Scotland.) He ended his playing days at Norwich in 1977. In conclusion, although his Gloucester career was short, a quick bit of arithmetic reveals that he was still only 15 (by two weeks) when he played for Gloucester United. It’s likely that he is the youngest ever to play for United and so the youngest ever to score a try for them, although not the youngest ever to play for Gloucester’s First Team, who we believe to be Michael Baker, at the age of 16.